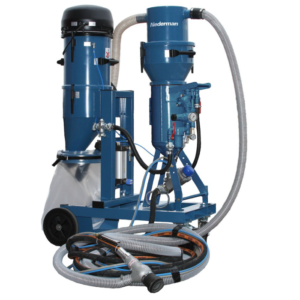 Envirox supplies portable Nederman dustless sandblasting equipment with superior suction power and separation efficiency for all light-duty and industrial applications. 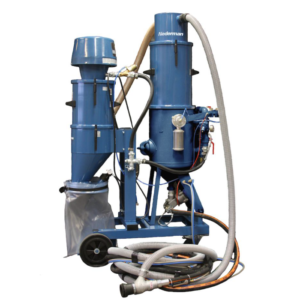 This range of sandblasters provides clean, safe sandblasting along with effective media recycling. Taking blasting technology one step further by doing away with the conventional drawbacks and health risks associated with blasting, Nederman sandblasting equipment provides a completely dust-free process and ensures that the surrounding area is not exposed to flying blasting media. A robust industrial sandblasting system, this equipment is mobile and can be easily moved for use indoors, outdoors and in confined spaces where conventional blasting would not be allowed. Because sandblasting media is continuously sucked away during operation by the built-in vacuum unit to deliver a completely dust-free process, it is ideal for safe use in work spaces that contain other active operations. The blasting agent is automatically drawn back into the unit by a built-in vacuum, where it is cleaned and recycled as part of the dust-free process, known as vacuum blasting. This makes for a much more efficient blasting process as work can be carried out more effectively with fewer interruptions for refilling of blasting agent and also means that the work space will not need to be cleaned once the work is done. It’s dust-free and safe as this process permits a clean and interruption-free environment for colleagues without impacting surrounding work spaces. It does not require screening or special protective equipment to be worn and doesn’t require a separate blast room. It’s economical as blasting media can be re-used at least three times and no post-cleaning is required. It is environmentally friendly, as blasting replaces the need to use chemicals and rust agents; all approved blasting media can be used, like glass beads, steel grit, all oxide and nutshells. It’s non-disruptive, as the air from the unit is purified and returned to the work environment while blasted material is collected in a waste bag. It’s flexible with a compact, mobile unit it’s easy to move between work stations and the sandblasting vacuum unit can be operated either electronically or by compressed air. 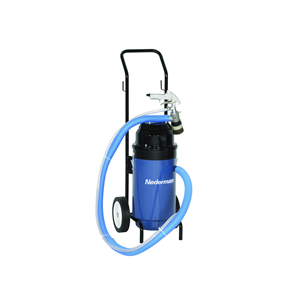 Your portable Nederman vacuum blaster lets you blast exactly where you need to. It’s always at hand for easy cleaning and maintenance. Clean structures and remove harmful isocyanates released during welding and heating processes. Remove rust on vehicles and metal structure; clean and clear tanks and vessels safely – even on the inside. Clean welding joints effectively without the need for grinding tools. Clean castings and remove casting beads of aluminum, composites etc. Remove paint, rubber/plastic coverings on floors, rollers, etc. to give new surface coating good adhesion.